Computer Science for Fun - cs4fn: Life in the Undergrowth: Commin to get ya! Life in the Undergrowth: Commin to get ya! When hoverflies get the hots for each other they make some interesting moves. Biologists had noticed that as one hoverfly moves towards a second to try and mate, the approaching fly doesn't go in a straight line. It makes a strange curved flight. Computer scientists thought this was an interesting observation and started to look at why it might be. They came up with a cunning idea. The hoverfly was trying to sneak up on its prospective mate unseen. The route the approaching fly takes matches the movements of the prospective mate in such a way that, to the mate, the fly in the distance looks like it's far away and 'probably' stationary. How does it do this? Imagine you are walking across a field with a single tree in it, and a friend is trying to sneak up on you. Your friend starts at the tree and moves in such a way that they are always in direct line of sight between your current position and the tree. In effect as they move towards you they are always silhouetted against the tree, their motion towards you is mimicking the stationary trees apparent motion as you walk past it... and that's just what the hoverfly does when approaching a mate. It's a stealth technique called active motion camouflage. By building a computer model of the mating flies, computer scientists were able to show that this complex behaviour can be done with only a small amount of 'brain power'. 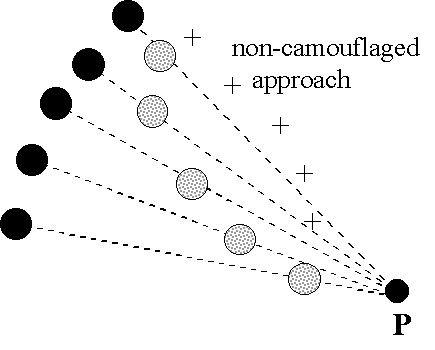 They also went on to show that humans are also fooled by active motion camouflage. They did this using a computer game where you had to dodge missiles, and some of those missiles used active motion camouflage. 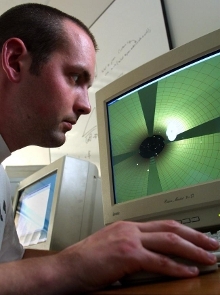 The missiles using the fly trick were the most difficult to spot, showing that there is such a thing as a useful computer bug.